As a rite of passage in her own world, the teenage Chun spends a week on Earth in the form of a red dolphin. A human boy drowns while rescuing her from a net in a storm, leading the guilt-ridden Chun to swap half her lifespan with the Soul Keeper to bring him back in the form of a small fish, which she names Kun. She must rear him to adulthood in order to restore his life, although the presence of a human in her world soon causes catastrophic environmental change, and threatens the very existence of her people. 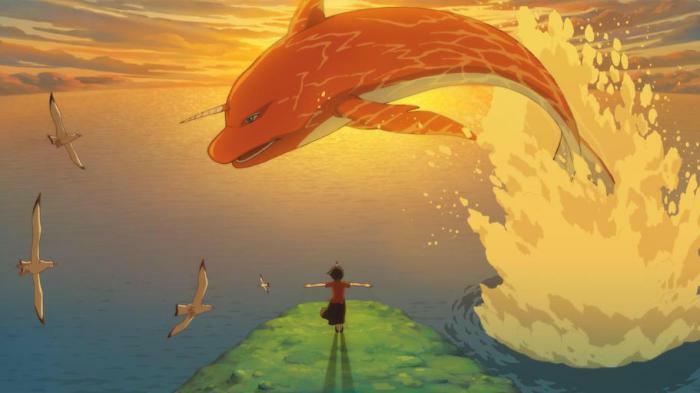 Big Fish and Begonia, written and directed by young animators Liang Xuan and Zhang Chun, took an impressive £64 million at the Chinese box office, and is certainly a landmark in the development of Chinese animation. Its creators operated largely outside the Chinese system, struggling for over a decade to put their film together, building it up from an outline based on a half-remembered dream, to a pilot film, to a full-length feature. Liang and Zhang’s fantasy is set in an indistinct Chinese dreamtime. The “myths” it draws upon, however, are largely the creations of the writers themselves, “Chinese” only in the sense that they have been made up by Chinese people. Its heroine dwells in a mythic land that is at least partly inspired by the tulou roundhouse culture of Fujian on the south-west China coast. Chun’s homeworld is a nebulous land of the dead, where good souls turn into “fish” and bad souls into rats – the directors themselves have waved off quibbles about whether the narwhal-like Kun is a fish or a mammal. The character design, attributed to Zhang, is an inventive carnival of otherworldly oddities – bawdy old ladies, scowling men with fire for hair, a sinister cyclopean mentor – many playfully deriving from the here-be-dragons descriptions of faraway lands from the Classic of Mountains and Seas. 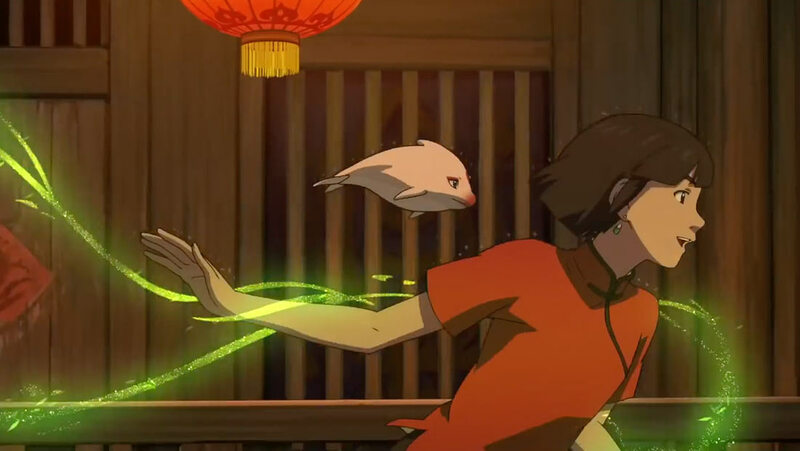 The animation, meanwhile, focuses its attention on unexpected areas – a herd of compliant cats, for example, or the costly data required to make a spirit’s scarf flutter in the wind. True to many a Chinese fantasy film, the blurb nods in the direction of classical texts, although as ever, not in any particular depth. The story vaguely derives from a 3rd century BC text, the Book of Zhuangzi. “In the North,” one part reads, “the fish roe (Kun) turns into the giant roc (Peng), the wingspan of which extends for countless leagues. When Peng ascends, his wings spread across the sky like clouds….” Scholars have argued over this passage for centuries. Hyun Höchsmann and Yang Guorong, in the footnotes to their edition of Zhuangzi, suggest that the text’s juxtaposition of the tiniest sea creature with the largest bird is a “metaphor of the unfathomable workings of the mind in its search for the ultimate nature of reality.” Writer-directors Liang and Zhang, however, take the cheeky step of interpreting it literally, taking the opening pages of Zhuangzi, along with a later passage about a long-lived tree, as a description of a fantastic otherworld. Your mileage may vary. I can imagine a coterie of chin-stroking Sinologists, chuckling at such audacity and at its uses – luring in parents who think that their kids might learn something worthy, and warding off the Party censor by arguing that this is not superstition, but a meditation on the work of a respected ancient philosopher. Zhuangzi, however, is not famous because he talked about transforming fish. His best-known quotes are far shorter and snappier, such as his iconic riddle: “Am I a man dreaming I was a butterfly, or a butterfly dreaming I was a man?” I suspect, too, that a bunch of critics have been kinder to this film than they might otherwise have been, sure that they must have missed some deep-seated resonance of Chinese thought. Ironically, an anime fan watching Big Fish and Begonia is liable to cut through such debates with Daoist bluntness, seeing not an arty exercise in philosophy, but an accomplished pastiche of the later works of Studio Ghibli. 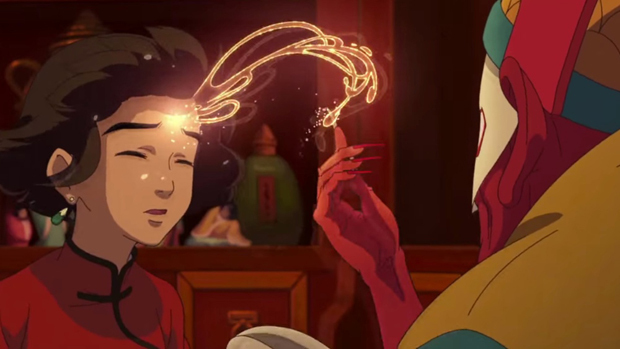 The look of the film, for example, and much of its onscreen business, are so redolent of Hayao Miyazaki’s Spirited Away that the two films could almost share a setting. This should come as no surprise – after all, why not learn from the best? Twenty years ago, when the Taiwan director Wang Shaudi was tasked with making Grandma and Her Ghosts, she, too, ran to the video shop for inspiration and grabbed the four best sellers, all of which were Ghibli titles. “We grew up in the 1980s,” observes Zhang, “so Japanese cartoons and Western cartoons were certainly an influence. We can’t ignore that.” Finding Nemo is also a possible touchstone, particularly for a scene where Chun finds dolphins trapped in a fisherman’s net. There are some odd missteps from scene to scene, suggesting the onscreen imagery wasn’t quite locked with the words of the script. A sorceress summons a portal, but is left straining to keep it open while the rest of the cast have some soup. A diver asks his sister to rub grease on his back, but then forgets about the task when distracted. In an attempt at broad comedy, a horse shits on a boy’s head, although in the next shot it is as if nothing happened. A boy plays an ocarina, but his fingers don’t match the tune. Even the dynamics of gravity and floating in water are occasionally discounted – sometimes Kun seems to have invisible off-screen feet holding him up. It is as if the creators have disregarded the physicality of the events on screen, and how they might affect the characters if they were real. In other words, it looks like a Miyazaki film, but it doesn’t feel like one. One does not sense, in Big Fish and Begonia, that the characters have got their feet wet, or indeed that they have had any trouble getting horse poo out of their hair. As in many a martial arts film, characters with magical abilities lose their mass and inertia, and hence reduce their sense of realness. This may be a feature of the piece-meal way that the film was assembled. Liang and Zhang began work on the Big Fish and Begonia project in 2004, with the release of an online Flash short as a proof of concept. Their struggles to even scrape together the money for a script are well-documented, and full funding had to wait until 2013, when the Chinese media suddenly became aware of the vacuum that was likely to be left in the global animation market by the retirement of Miyazaki. Liang Xuan courted controversy that year when he wrote an open letter to online investors, stating that “No good animation has come out of China in 30 years,” suggesting that China has produced little of value since 1979’s Nezha Conquers the Dragon King. Asides in Chinese media coverage suggest that even after production began, the crew was assembled in sections, with four separate hiring drives, presumably related to milestones in funding and completion. This background has rather trapped Big Fish and Begonia between two stools – it wants to be a blockbuster movie, but it might be better parsed to fans as China’s answer to the have-a-go heroism of Makoto Shinkai, whose Voices of a Distant Star similarly grew from small beginnings. Most impressively, Big Fish and Begonia made it through at least part of its production process on crowd-funded donations. A hundred yuan (about £10) would secure postcards and a ticket, but one newly-wed fan went substantially higher, donating her dowry of half a million yuan, a third of the whole crowd-funded kitty. Liang Xuan got on a train to personally thank her, and to calm down her panicking fiancé. With 1.5 million yuan raised, the publicity of the grass-roots operation finally attracted more solid investors in 2014, and production could truly begin, with funding from Enlight Media and animation from Seoul’s Studio Mir. The crowd-funded investment was folded into the directors’ own production credit, “B&T”, derived from their rather awesome net handles, Breath and Tidus. It is for this reason that the credits take ten full minutes to roll – a mid-credits sequence adds an important plot point and jams in one last quote from Zhuangzi, before hundreds of online backers’ names crawl past. Arguably, the production delay worked to their advantage. Animation technology had changed so much in the intervening decade that 3DCG was a viable option for what had originally been planned as a 2D movie. The directors have made no comment as to what extent their standard-bearing “Chinese” animated film was actually made in South Korea. 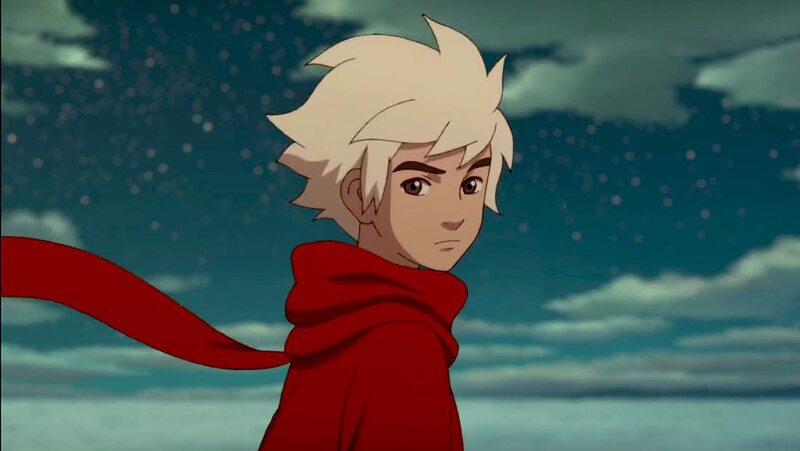 The change in the media climate in China, finally making a film like Big Fish and Begonia possible, also afforded the creators access to high-level talent – composer Kiyoshi Yoshida, best known abroad for The Girl Who Leapt Through Time, and performers like popstar Timmy Xu, who voices Kun. Ji Guanlin, who plays Chun, is one of China’s leading voice actors – dubbing not only foreign stars like Jennifer Lawrence, Zoe Saldana and Anne Hathaway, but also big Chinese names. In a live-action film environment where sound might not recorded on set and stars often unavailable to dub themselves in post, hers is the voice that audiences often hear when they see onscreen performances of Angelababy, Fan Bingbing and Cecilia Liu. China is simply too big, and regional accents too varied, to guarantee that an entire cast will sound believably local onscreen – Ji Guanlin has carved out a niche for herself as the Mandarin Received Pronunciation voice of a bunch of stars. In an interview with the Sina website, the co-directors admitted to arguing about anything and everything, while passers-by shrugged in confusion. One of their biggest spats was over whether the tragically friend-zoned character of Qiu should have white hair – an entirely everyday occurrence in the world of anime, but unreal in a depiction of ancient China. Eventually, they put it to a vote online, only for the denizens of the internet to frustrate them with a 50/50 split. It’s a funny story, but it also illustrates the perils of delegating authorial responsibility. Someone on a creative production has to make those sorts of calls, and it seems that elements of Big Fish and Begonia were not merely crowd-funded, as crowd-produced. Jonathan Clements is the author of Confucius: A Biography. Big Fish and Begonia will be released in 2018 by Manga Entertainment.